Netanyahu thanked Trump for his "tremendous support to Israel, including the recognition of Jerusalem and the Golan Heights, as well as for his steadfast stand against Iran." U.S. President Donald Trump has called Israeli Prime Minister Benjamin Netanyahu to congratulate him for his “apparent victory” in Israel’s parliamentary election, Netanyahu’s office said. Trump called from the Air Force One and “warmly congratulated” Netanyahu, the Israeli Prime Minister’s Office said in a statement. “The two leaders reiterated their appreciation for the deep friendship between themselves and their countries,” the statement said. They agreed to keep working together on mutual interests. “The two agreed to continue working together closely for Israel and the United States,” the office said. The moves were widely perceived in Israel as gestures to support Netanyahu in his closely-fought election race against his main rival Benny Gantz. 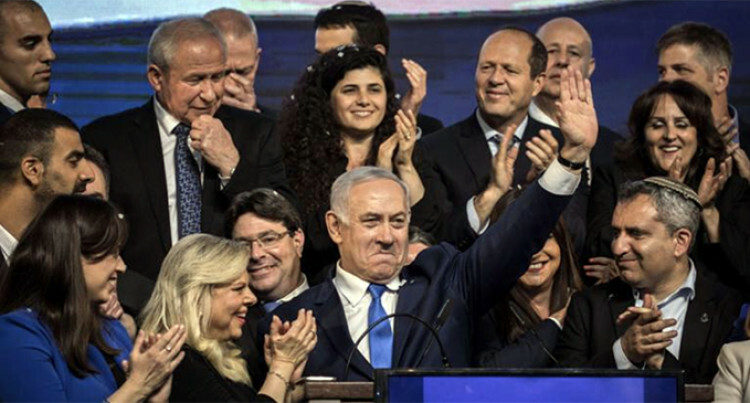 After counting some 99 percent of the votes, Netanyahu’s right-wing Likud party and Gantz’s centrist Blue and White party won each 35 seats in the 120-seat parliament. However, Netanyahu appeared on course to his fifth term in office as the right-wing party secured an overwhelming majority bloc, meaning Netanyahu was likely to form a governing coalition with right-wing parties. Netanyahu and Trump have been holding close and friendly ties. Their last meeting took place in Washington on March 25.